Doesn’t that sound like a great swear word? 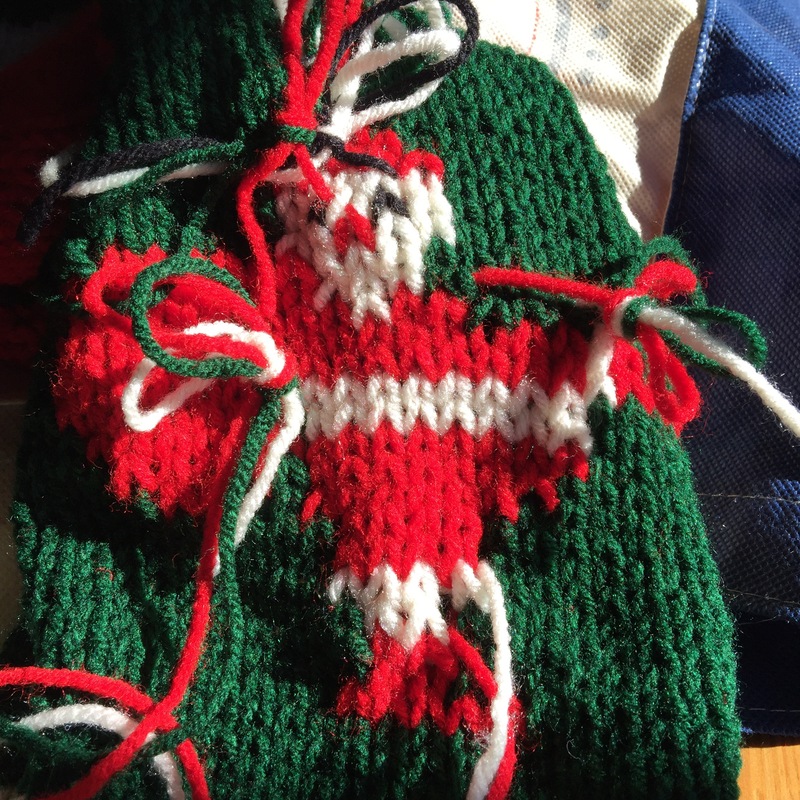 Intarsia! Like “tarnation”! It seems to me like it has a satisfying cadence to it. Well, I put it to good use over the past couple of days! I got going on my commission stocking. The pattern is an older one and calls for knitting the stocking flat from cuff to heel, joining the back of the heel to turn it, then knitting the top and bottom of the foot separately and flat. You then sew a seam up each side of the foot and from the heel up to the cuff. Strange construction. I figured I would just knit the damn thing in the round and it would be a lot easier. Right? Ack! 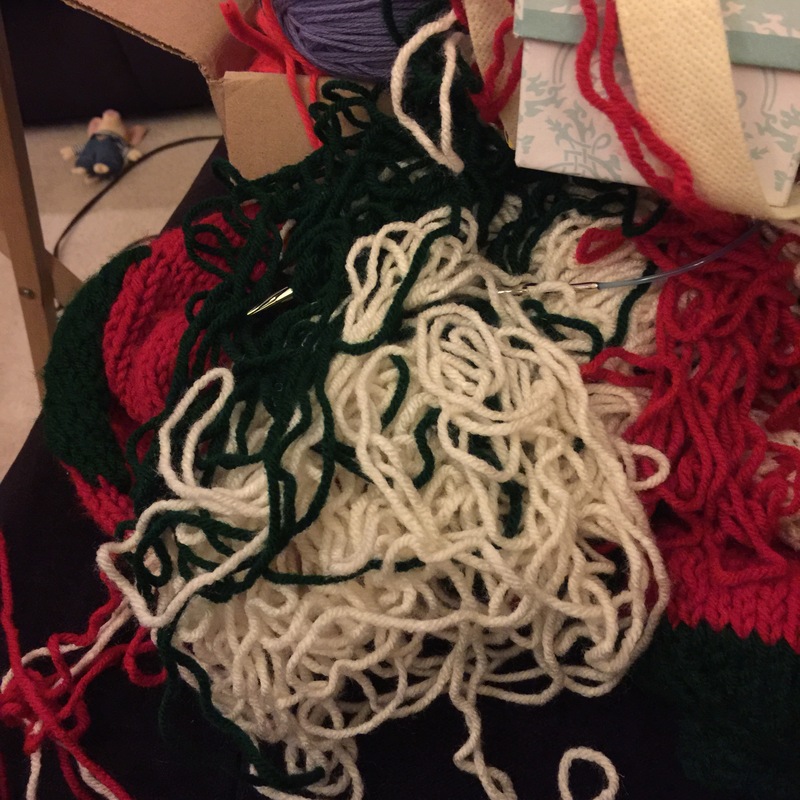 More yarn barf! But I started it over and was able to get back to the same point pretty quickly. Let me pause here and add some background information. 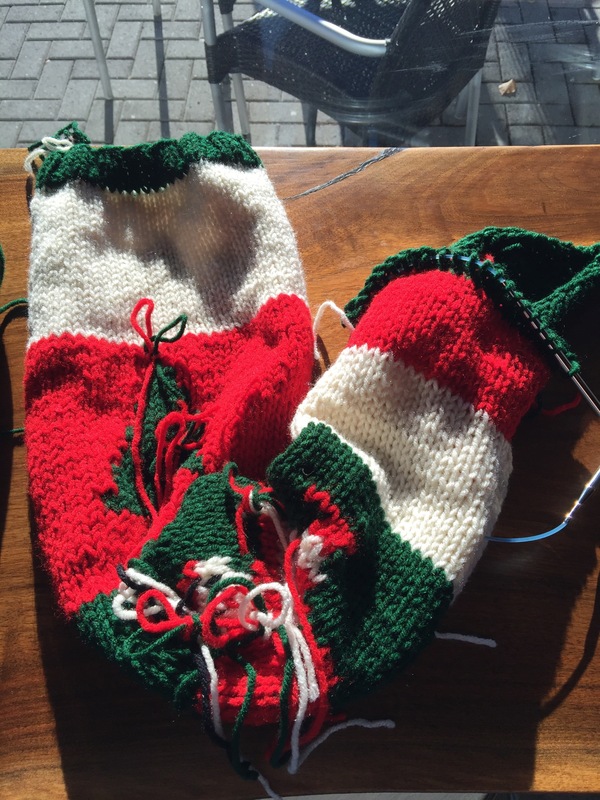 The person who asked me to do this project has three stockings already from the same pattern. Her MIL used to make them but has since passed away. Well, they need a fourth for the “baby” (who is almost three) and she wants it to match the older child’s stocking. Over the years, the MIL’s gauge got looser and looser so while the first couple of stockings are a normal size, the older child’s is ginormous. It’s been a challenge to match it as I am a pretty snug knitter. I initially bought bulky weight yarn, thinking that would make it easier for me to match the gauge (about 3.5 sts/” in Aran weight) but I couldn’t get it to work. So, I switched to Aran weight (Red Heart Super Saver, as that’s what the others are made from) and on US10.5s, was able to get gauge. It’s loose, though. But, since the prototype is really loose, I guess it’s okay. So, since I’m cruising away on pretty big needles, it’s been knitting up quickly. 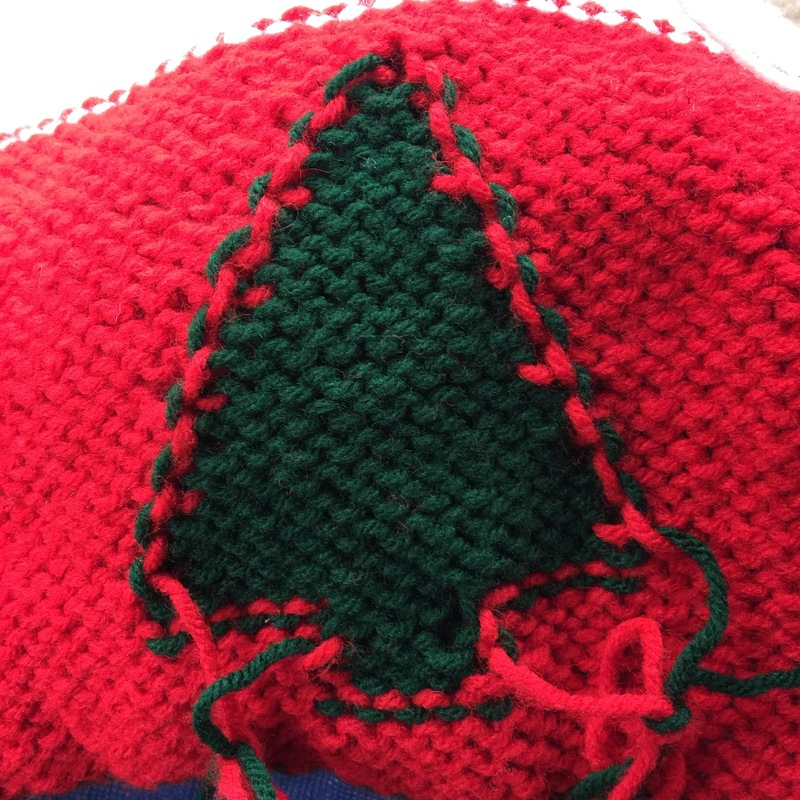 I got most of the way through the tree but pulled that section out again as I was knitting tighter and tighter. Once I redid it, it looked really good. Then, the Santa. That one was a little fiddly because it used four colors total and they were often spread out a good bit. But, I got it done and I think it will look great once all the ends are woven in. This morning I was able to finish up the last of the knitting. Now I need to weave in ends, add the name and birth year in duplicate stitch, sew up the seams and add a braided cord with pompoms and it will be done! This has been a fun project and a nice little walk down memory lane. My mom used to make similar stockings for the family and for friends. It’s made me think I’d like to make stockings for my family! But not until next year…! That looks super nice! You are a much braver soul than I 🙂 I hope to get into it next year. I can’t wait to see it finished! Girl, you are a hero for just jumping to the rescue like that! Damn, girl. You are brave and have got awesome skilkz. I have been staying away from intarsia as long as I can. Man you did a great job on that! 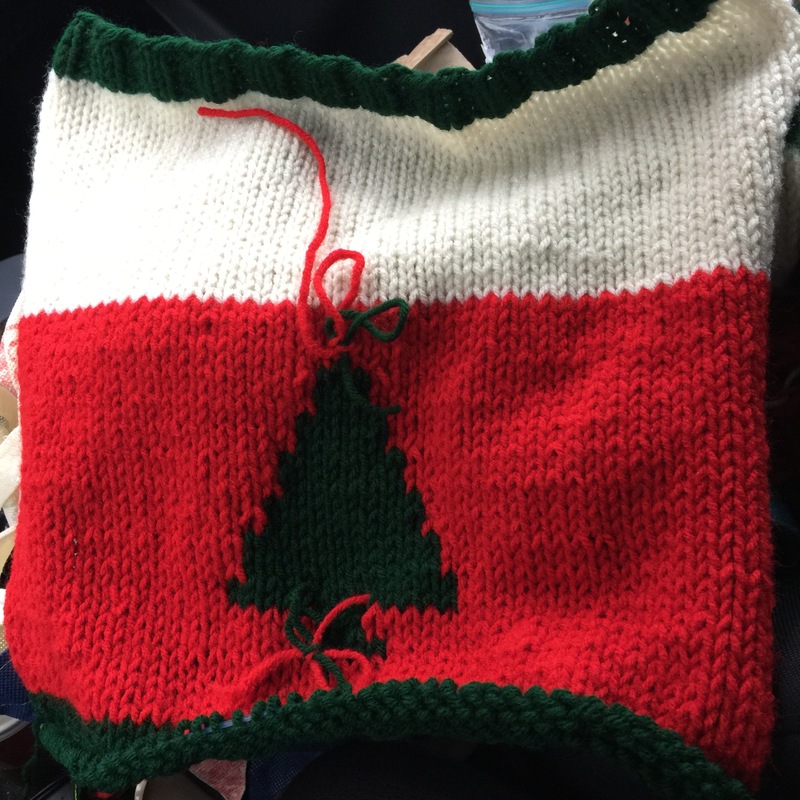 I tried intarsia a few times but I seem more interested in complex charts that require a dozen tiny balls of yarn dangling in the back, than a relatively simple chunk of Christmas tree. Naturally that gets fudged up and I throw my knitting out the window lol. Duplicate stitch is for me. Your intarsia technique looks totally on point though, I’m very impressed! You’re tree looks great! Intarsia is such a pain! I always forget you can do intarsia and duplicate stitch together. Same some chaos and do the little bits in duplicate stitch later. I wish I’d remembered that as I was working on my R2-D2 beanie 🙂 I kinda don’t want to repeat that mess, but I kind of want to because I know I can do it better! You are brave! 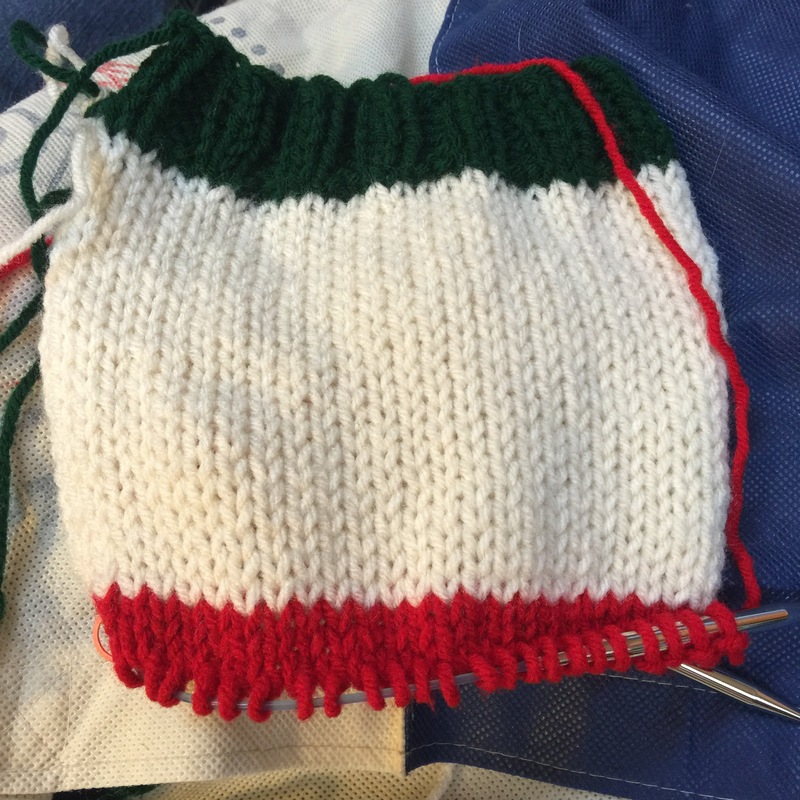 I am working on a stocking now also…although I am taking a much simpler approach. Because I am LAZY.